Mahawu Mountain is a volcano that settled near to other famous mountains, which is Lokon and Empung. 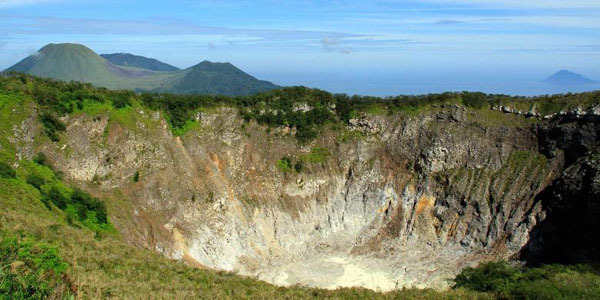 Mahawu is a volcano stratovolcano that located in the east of Lokon – Empung Mountain that has a width of 180 m and 140 m deep crater with two pyroclastic cones on the northern slope. There was an explosion that occurred in 1994 with the fumaroles and mud geyser activity that occurs along the crater that full with greenish color. Along the trip to this Mountain, we can enjoying the sun that rises in early morning that will feel quiet and shrouded in thick fog and feel so cold, tends to be so freeze. To reach this location, we can start from Tomohon to Rurukan, and then walk along the path which passing through vegetable garden and it finally reach the summit for about 1324 above sea level. After going through a beautiful forest and shady cone in crater area, there will be overgrown grass with an altitude of 1200 meter above sea level. Mahawu is a relatively gentle mountain to climb for beginners, especially the accessible is easy and the road is already that purposely built for easy access to the summit. In the foot of Mahawu the residents work as farmers and plant a variety of vegetables at the foot to the middle of the mountain. Because the mountain is not too big and easy in ascent, if the tourists want to climb, then it can be reached within an hour. Unlike the other volcanoes that tend to be sandy at its peak, this Mahawu peak is green and there are a lot of plantations that grow finely.